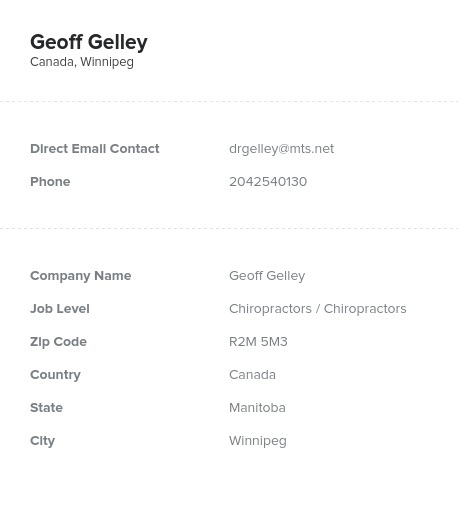 Find chiropractors’ offices across Canada and start marketing to them easily with this premium prospect list from Bookyourdata.com! With this reliable, accurate, and human-verified database, you can find chiropractors’ emails, phone numbers, addresses, company information, and much more. Are you hoping to market to chiropractors in Canada? Then you need an accurate lead list that consolidates the contact information of this vast, spread-out group into one organized resource. Luckily, Bookyourdata.com offers an already compiled, pre-built database, which contains the premium, full, direct contact information you need to get in touch with them. Download this directory right after purchasing it, easily pull it into your sales program or CRM, and start connecting with your target audience within minutes of purchasing. Chiropractors help to heal a wide array of patients both young and old throughout the country. Using alternative medicine practices, they often manipulate the musculoskeletal system such as the spine, joints, and soft tissues to ease pain and prevent disease. Focused on non-medicated repair, these specialists heal their patients over time and often many visits. They use tools ranging in complexity, from tables to X-ray machines. If you have a product that can specifically help chiropractors' offices function more efficiently, definitely let them know. This lead list of chiropractors within Canada is useful whether you're marketing magazines, massage chairs, chiropractic-specific equipment, or other medical equipment. Market to your target audience and email, write to, or call chiropractors in Canada today!